I don’t want to mislead anyone – we actually had great weather on the cruise, it was just Orlando (and the first couple of hours in Port Canaveral) that were cruddy. The Quality Inn…well, it had like two stars on Hotels.com. Bryan claims that it exactly matched his expectations. It was mostly filled with frail looking old people when we came down to breaky the next morning. And all that was on the news was a story about a guy who had claimed he had a bomb on a cruise ship (different line, though). Good start. 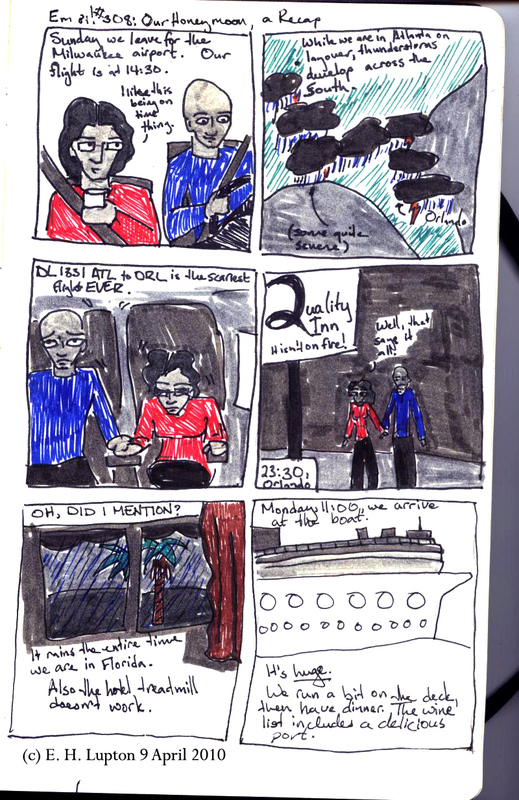 Honeymoons — Bahamas–Biography–Comic books, strips, etc.